Iraqi Prime Minister Nouri al-Maliki on Friday rejected a U.S. Senate proposal calling for the decentralization of Iraq's government and giving more control to the country's ethnically divided regions, calling it a "catastrophe." The measure, whose primary sponsors included presidential hopeful Sen. Joseph Biden, D-Del., calls for Iraq to be divided into federal regions for the country's Shiite, Sunni and Kurdish communities in a power-sharing agreement similar to Bosnia in the 1990s. 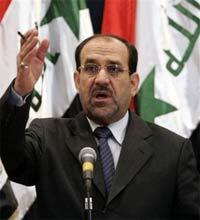 In his first comments since the measure passed Wednesday, al-Maliki strongly rejected the idea, echoing the earlier sentiments of his country's vice president. "It is an Iraqi affair dealing with Iraqis," he told The Associated Press while on a return flight to Baghdad after appearing at the U.N. General Assembly in New York. "Iraqis are eager for Iraq's unity. ... Dividing Iraq is a problem and a decision like that would be a catastrophe." Iraq's constitution lays down a federal system, allowing Shiites in the south and Kurds in the north to set up regions with considerable autonomous powers. But Iraq's turmoil has been fueled by the deep divisions among politicians over the details of how it work, including the division of lucrative oil resources. Many Shiite and Kurdish leaders are eager to implement the provisions. But the Sunni Arab minority fears being left in an impoverished central zone without resources. Others fear a sectarian split-up would harden the violent divisions among Iraq's fractious ethnic and religious groups.